From time to time I will add new knitting tips. Traditional toe shaping is accomplished by working decreases one stitch away from each edge of the top and bottom (or instep and sole) of the sock. That is, instep stitches would be worked in this manner: K 1, SSK, knit to last 3 instep stitches, K2tog, K 1. The sole stitches are worked the same way. Our foot shapes are not identical, and there is no end to toe length/foot shape variation! 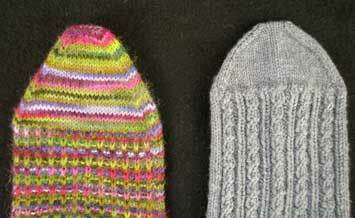 Some knitters make “anatomically correct” socks, that is they knit a sock shaped specifically to fit each foot. Some people love the fit; others caution that any wear patterns and pressure points will be exaggerated if the same sock is worn on the same foot day after day, shortening their likely life span. If I am knitting a sock for a person with a wider foot, or someone who likes shoes with wide toe boxes, I will use the following alternate toe shaping to create a rounded and blunter toe. 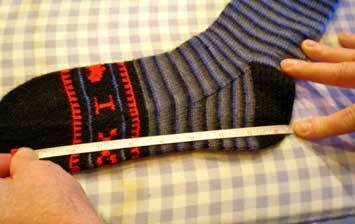 Doing this will make the stockinette toe portion of the sock shorter than that in a sock with pointed toe shaping. See the sock on the right in the picture above. Because the toe is not shaped as gradually, the sock foot needs to be a bit longer to compensate for the shorter toe shaping. I generally begin the blunter toe shaping when I’m 1-1/2 inches from the desired finished length (instead of 2 inches). 56 divided by 2 = 28 (half of stitches to be decreased). When there are 22 instep stitches and 22 sole stitches remaining, you have accomplished half of your decreases. For a blunt toe from this point on work only the decrease round, that is on every round for both instep and sole stitches, K 1, SSK, knit to the last 3 stitches, K2tog, K 1. Do this until there are 16 total stitches left. Close the toe with the kitchener stitch. Experiment to see what recipients of your socks like best, and enjoy making socks that fit the wearer! Now that you’ve made socks that perfectly fit some special person (who may in fact be you! ), it’s smart to note all the important numbers that you’d need to reproduce them. This is not different from writing down ingredients and proportions for a particularly good stew or soup or creatively-developed salad dressing. And I have learned all of this the hard way, of course. Years ago, I knit a wonderfully warm, soft as butter, fuzzy pair of socks for my husband Terry. He took good care of them, washing and drying them by hand, and wore them only on the very coldest days. Because they were such great warm socks and looked good, I took them as models to beginning sock classes I taught. Invariably I was asked the same question: “Exactly which yarn(s) did you use in making these socks?” Of course, I had no idea and no notes. Alas, like the Ancient Mariner, I took them around to various shops, told my sad story, but no one could help out. These were absolutely the most wonderfully warm socks, attractive but at the core forever destined to remain mystery socks and never to be exactly replicated. Moral: Keep good sock knitting notes. People who have been gifted with your socks or who see ones you’ve knit are likely to ask for some themselves! This, thankfully, gave me enough information to deal with the REPLACEMENT CRISIS that loomed over me six years later! A few weeks later on a quick trip through Canvasworks, a yarn store in Olympia, WA, I happened on exact yarn that I needed!! The re-footing was started (more about “to mend” or “to refoot” later) on 11/1/07 and finished around 11/26/07. Since that time, he has been identifying socks to be fixed sooner rather than later (which is better). I assume he held onto the original ones until the last moment because he didn’t want me to be upset to see what had happened and to learn from me that they were terminal. I understand this well because I once waited a long time before taking a dog to see a vet after I’d diagnosed that the dog had heartworms and would surely die soon. Imagine my chagrin, mixed with extreme joy, when I finally went and learned the poor dog had bronchitis and a worsening cough that could be easily treated. You may be puzzled now, wondering why it’s good to keep notes if it means you might then have to replace them in the future. I am happy knitting socks for people I love, and knitting a new foot or mending an otherwise sturdy sock takes much less time than casting on from the beginning and knitting a new pair. #3 Trick: How to measure progress in projects that go on and on and on…! One of my lace knitting friends once suggested I put a coilless pin or marker into the edge of my lace project to mark where I stopped before bundling it up for the day. Adding a marker when you stop each day for several days enables you to measure your progress. When she told me about this, I remembered paddling a canoe during summer vacations at a small lake in Minnesota. Without such stationary markers, the distance from where we began to where we wanted to go seemed to get longer and longer…the end of the trip kept stretching further and further away. Markers at the edge of lace projects (and why not socks, sweaters, afghans, and other knitting projects?) enable us to see how far we’ve come, in contrast to what we often see: how much more remains to be done. I have appreciated her tip. I want to say thank you for the sock tips! Am also recently retired and knitting! I worked for the postal service for nearly 33 yrs. Am now doing charity knitting for the most part. Have just finished a blanket for Project Linus. I sell my (well am trying!!!) on zibbet. I will be donating a portion of those proceeds to a domestic abuse shelter that aided me many many moons ago. If I may, I have a little sock tip. You probably already have this one figured out, but here goes anyhow. When knitting toes and heels of socks, I use a very fine strand of cotton in a matching color . It serves as a bit of reinforcement w/o being overly bulky. PS are you on ravelry? Yes, I’m on Ravelry but haven’t been doing much yet about putting projects up, etc. Soon I want to get a designer’s site up and post some new patterns. But that will have to wait a couple of months. Love the sock pictured! What do they say? I ❤️……? Just curious cause I like stranded lettering. One pair said “Breathe” and “Relax” on each sock. It was a message I sent myself when under a lot of stress!